You can’t have monarch butterflies without milkweed plants (Asclepias), and with the recent decline of monarch populations, we need to protect this vital, host plant. 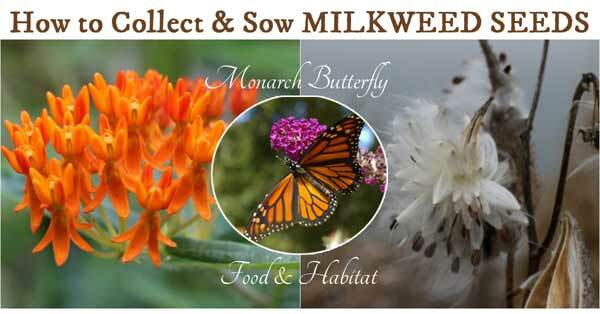 In addition to our beloved monarchs, birds, bees, spiders, beetles, and other beneficial insects also rely on milkweed. 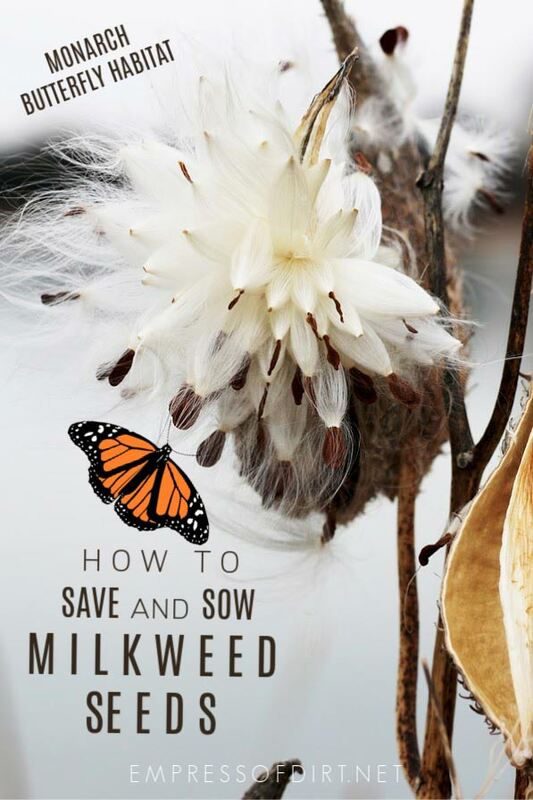 I’ll show you the right timing for collecting milkweed seeds from existing plants and how to sow the seeds. It’s never easy to get the message out about threats to the environment and endangered species. News like this can seem both abstract and overwhelming. There are so many attention-worthy issues and you never know which ones will catch fire. Both bees and monarchs have managed to make headlines in recent years, as their populations have faced numerous struggles. And, while their declining populations are just one symptom of a larger problem, it’s a good step forward. Anything that brings greater awareness can help. The ultimate dream for those of us who love nature—and realize that without it we’re toast is—everything matters. 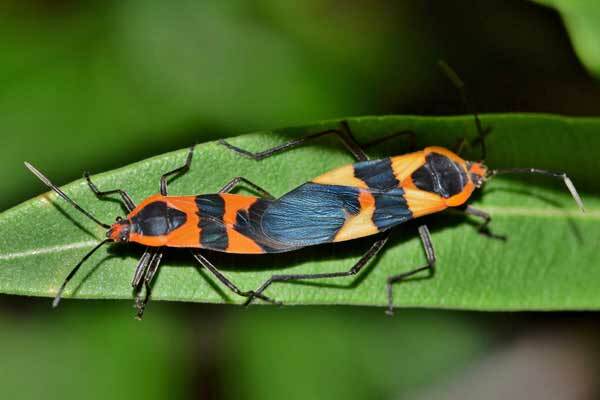 Good bugs. Bad bugs. All species. Everything has evolved together to create interdependent life on earth. The more we reduce pollution, grow organically, and protect habitat, the better off we all will be. Milkweed (Asclepias L.) is an American herbaceous perennial with over 140 known species. This plant has gained attention in recent years because some types are the sole host plant for monarch butterfly larvae (babies). No milkweed, no monarchs. Milkweeds are also a nectar source for bees, and many other beneficial insects and their prey. The fluff (called coma) from the seed pods provides nesting material for birds and animals. The ‘milk’ of milkweed is a sappy, latex-like substance. It is irritating to touch and toxic to animals. Historically, hunters used milkweed in arrows to weaken prey animals. 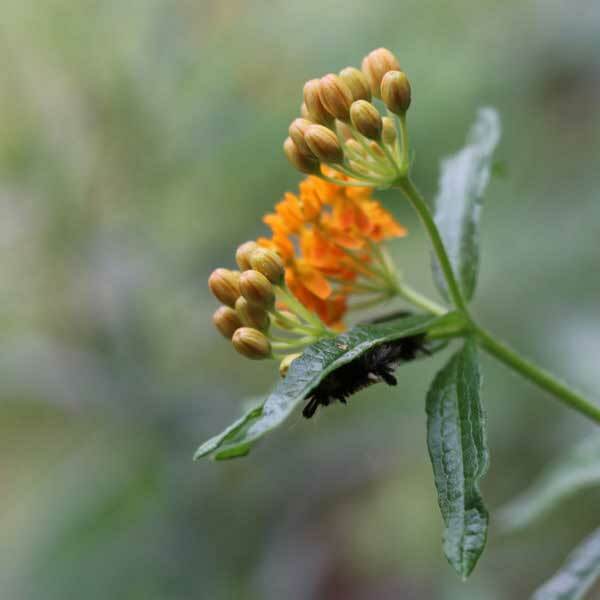 Type species Asciepias syriaca L.
Trivia / Uses Leaves of the Asclepias species are the only food source for monarch butterfly larvae and other milkweed butterflies. 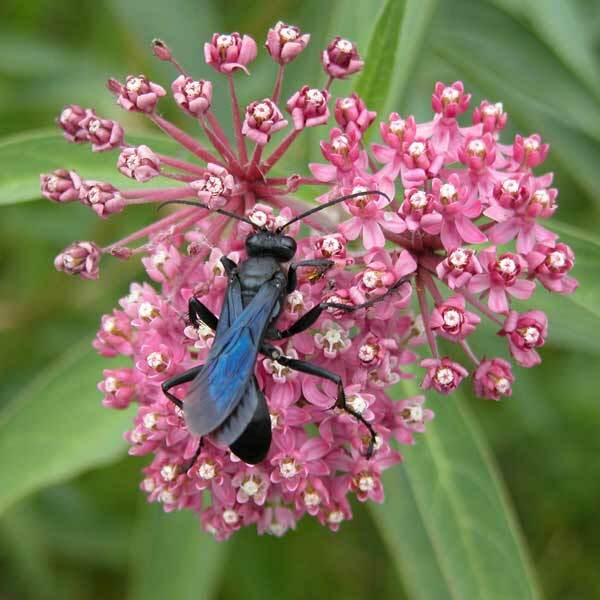 Pest Repellent Milkweed is beneficial to nearby plants, repelling wireworms. Plant Uses The coma (fluff, floss) is used for insulation, pillow stuff, absorbing oil. Precautions Milkweed sap can be irritating to skin and harmful to eyes. Wear gloves when handling milkweed and wash your hands thoroughly when done. Milkweed flowers have complex structures and the pollination process is interesting. The pollen is contained in sacs (pollinia) that stick to the feet of visiting pollinators including bees and butterflies. Upon flying away, the sacs break open, releasing the pollen into the flower, or may be carried away to another milkweed for cross-pollination. Sometimes, they are too sticky and the insect is trapped. 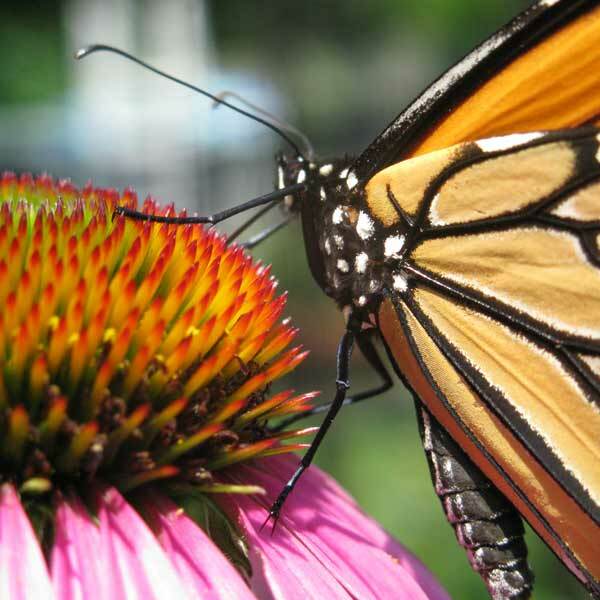 Monarchs have co-evolved with milkweed, using it as a natural defence. Ingestion of the sap by the monarch caterpillars makes them taste horrible to potential predators like birds. Blech, they say! Those orange and black markings are code for: don’t eat me, you will regret it! Other butterfly species have also adopted these colours to foil the birds. They don’t eat the milkweed leaves but they look like they do, so those predators leave them alone too. It’s very cool! 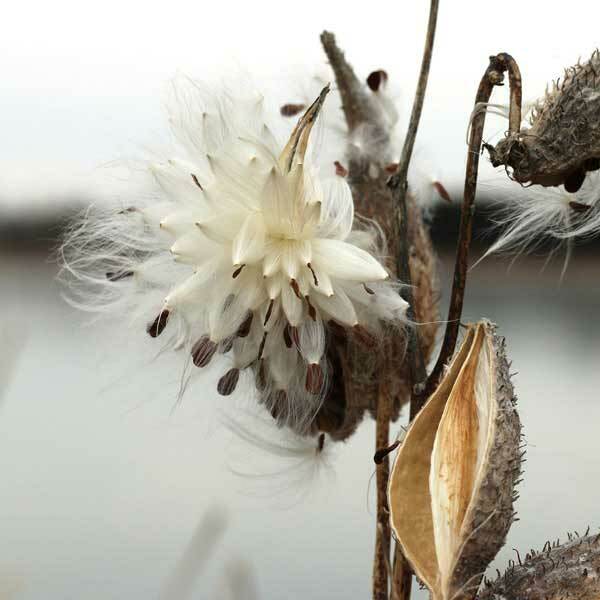 The familiar, fluffy white stuff found in milkweed pods is called coma, also known as silk, floss, plume, or pappus. It is used for insulating clothing. It’s less successful as a pillow stuffing: lacking fluffiness for comfort. Coma is also good at absorbing oil with potential for absorbing oil spilled in waterways. Orange flowers. Some cultivars have yellow flowers. Red-orange with yellow flowers. Native to South America. 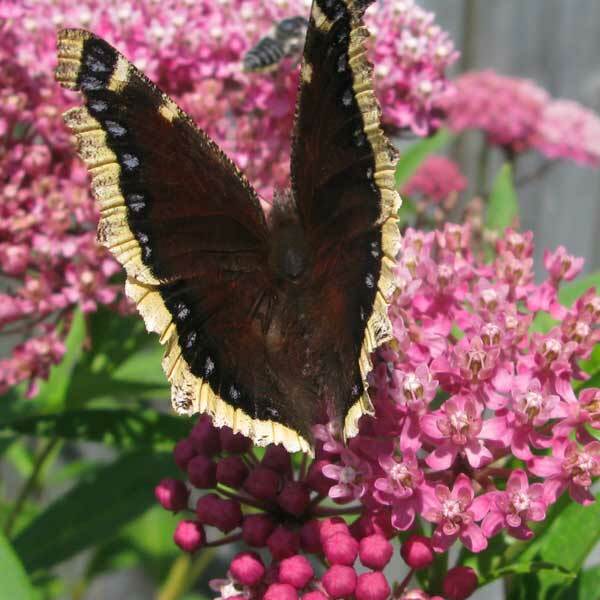 In Canada and the United States, avoid Asclepias curassavica or tropical milkweed which causes problems for the monarchs. 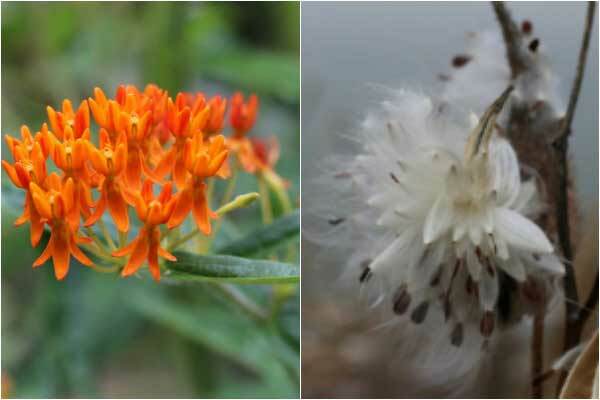 Get familiar with milkweed: there are some imposters out there. Prior to flowering, dogbane (Apocynum cannabinum) and smartweed (Polygonum genus) may fool you. In fall, once the infamous seed pods are popping open, revealing the fluff (coma) and seeds inside, it’s easy to identify. Know your local laws. In some areas it is illegal to remove any natural materials from public or private property. I collect the seeds from the plants in my own garden. Grow diversely. Because milkweed plants tend to be clonal (closely related), it is worthwhile to collect seeds from several different areas for better germination rates. Plus, diversity is best for a healthy garden. Wear gloves. The sap of milkweed can be harmful to both skin and eyes. Timing is everything. Milkweed seeds are not viable if collected too soon. You can be too early, but probably not too late. Collect seeds in fall when the pods are open or open easily. They may be green or brown. The seeds should be brown and tough. Choose insect-free seeds. If the seed pod has milkweed bugs on it, the seeds are probably no longer viable (won’t germinate). Choose seeds from other bug-free milkweed plants. Notice how they have the same orange and black colours as the monarch, which says: don’t eat me—I taste horrid! Remove the fluff and any other plant materials. Place the seeds in a dry paper bag. I keep a list of seed sellers in Canada and the United States here. A local seed grower is your best option to ensure you choose milkweed adapted to your growing conditions. 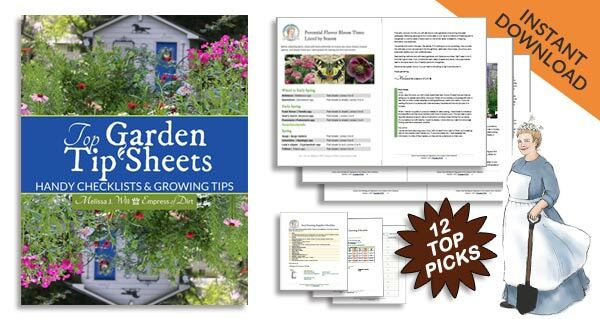 If you are collecting a large volume of seeds, there are lots of tips online for ways to remove the seeds readily without too much fluff fuss. There are also videos like this one showing how to use a shop vacuum to separate the seeds. The fluff is trapped by the filter; the seeds fall to the bottom of the canister. All milkweed seeds need vernalization, which is a chilling period prior to germination. This happens naturally outdoors in a cold climate: the plant drops its seeds in fall and they sprout in spring. Indoors, you can mimic this by placing the seeds in the fridge for several weeks before sowing them. Before adding any milkweed plants to your garden, check with your local conservation office or university extension office to ensure they are non-invasive and suitable for your region. The perfect time to sow milkweed outdoors is right when nature does it: when fall weather is consistently cool but not yet freezing. Sow the seeds and cover with soil. Keep watered until the ground freezes. Mark your sowing area with tags so you don’t mistake the germinating plants for weeds in spring. It’s not as successful as fall sowing, but you can also sow the seeds in soil in a container with a lid and keep it outdoors for the winter. There are photos and instructions here. This is probably the least successful method, but could work if you prechill the seeds adequately. A few months before last frost, place the seeds in damp paper towel or potting soil and keep them in a fridge. Sow outdoors after last frost. Look up your last frost date and count back 2-3 months. That’s when you want to stash the seeds in damp paper towel or potting soil in the fridge. Keep them moist and let them chill. Six weeks before last frost, sow the seeds indoors in seed starting mix or potting soil and place them under grow lights. Keep soil moist. The plants are ready for transplanting outdoors when there are 4 true leaves. The first two leaves are cotyledon: these are primitive, embryonic leaves supporting germination. True leaves (which look different) support higher plant growth. Plant outdoors after last frost. Keep watered until roots are nicely established (may take a few months). Before growing milkweed, find out the best varieties for your area, ensuring they are non-invasive. 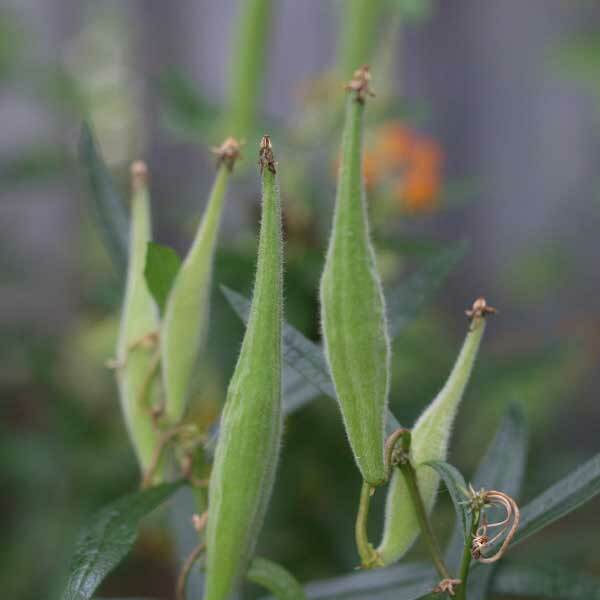 Collect milkweed seeds in late fall when the seed pods are brown and open, or green and easy to pop open. The seeds require several weeks of cold temperatures to germinate. 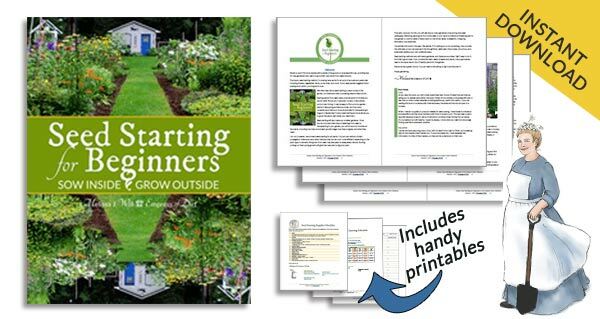 Direct sow in fall or indoors in spring. Now go grow some butterflies! Thanks, Melissa, that was a great article! I have one question for you though that’s not about seeding, but growing milkweed in general. The monarch caterpillars have stripped my plant completely bare of every single leaf! All left above the ground are the stems. Being a perennial, do you think the plant will survive?